In these essays toward a political philosophy we shall be con- cerned with fundamentals. And because it is a question of fundamentals, they will, we imagine, be of interest to many readers. We should like to contribute to a clarification, histor- ically and systematically, of some concepts with which every philosophy of society and the state has to deal. We shall admit historical considerations for the sake of insights into the sys- tematic ones, and we trust that our inquiry into the systematic will help us to understand the historical. For we are moving in that circle exemplarily described by Johann Gustav Droysen in his Vorlesungen fiber Enzyklopadie und Methodologie der Ge- schichte ( 37) when he writes: 'Undoubtedly we only under- stand completely that which is, when we recognize and make clear to ourselves how it came to be. But how it came to be, we recognize only if we investigate and understand, as exactly as possible, how it is. Our grasping that which came to be and comprehending its becoming is only one form and expression of our understanding of the present and existing. And this becoming and having come to be can be derived only by temporally conceiving and analysing the existing in order to understand it. ' 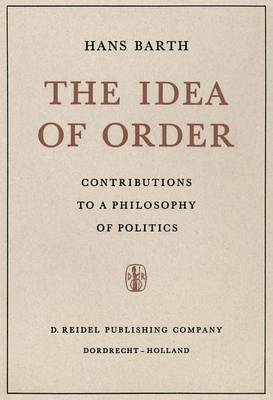 We must, therefore, center our attention on what may be called the structure and logic of social order.